Get Cosy is an event that is happening on my street next week. It’s been one of my projects for the autumn, working with the partners, doing the promotion, and this week walking the neighbourhood with the resident’s association delivering flyers through all the doors. The idea is quite simple – it’s to encourage people to insulate their homes. By doing a really local event, organised by and for a specific area, I’m hoping we can get neighbours along and get a bit of a conversation started. Insulating homes saves energy, saves money, and cuts carbon emissions while making our homes warmer and more comfortable. It’s the easiest of easy wins in reducing Britain’s CO2, but the up-front investment makes many people reluctant to spend money on energy efficiency, even if they would save in the longer term. Gas prices went up by 9% this month, and have doubled in the last five years, so it’s a good time to get cosy. I’m hoping it’ll be fun too. The council climate change team have been great and managed to score some funding for the event, so we have a whole pile of stuff to give away. We’ve also ordered in a bunch of different gadgets and energy-saving appliances, so there’s going to be a ‘gadget test area’. You’ll be able to do a thermal tour of the building, and sign up to have someone do a thermal tour of your home too, through Transition Luton. We’re also collecting cardboard boxes this weekend so we can make radiator reflectors in a workshop, and there will be local insulation companies around to give professional advice. It’s also something of a pilot project. The Energy Saving Trust have been quite involved, and they were interested in seeing how it worked and if it could be replicated. Unfortunately their funding has been pulled, but Transition Luton might run something similar in other parts of Luton next year if it goes well. If you’re in Luton, drop by. 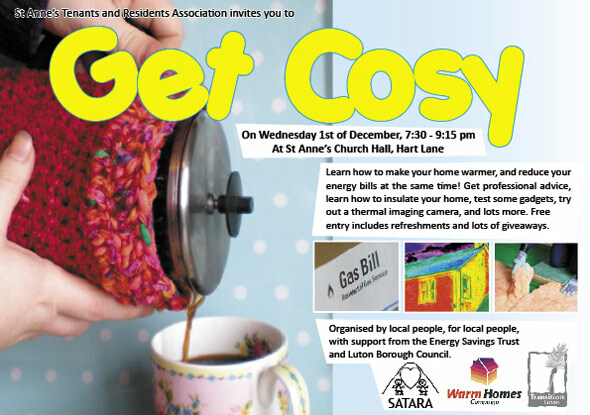 It’s 7:30 at St Anne’s Church Hall, on the corner of Hart Lane and Crawley Green Road, on wednesday December 1st.